Hi guys! You may have noticed there was no post yesterday, but that's because I had a lovely time waking up to a flooded basement due to a broken pipe. Fun times were had. Not really. But nevertheless, it's that time again for Wedding Bliss the weekly segment where I bring you nail art looks for brides to be... like me! This segment is part of the Preen.Me VIP program showcasing James Allen limited edition Nail Jewels, which are inspired by their most popular diamond rings! I thought I would try more of a classic look for this weeks segment. To be fair, this is a design I have done a few tries before but it has always been with bright or neon colors. I couldn't shake the want to do another variation of it and so here we are. I feel like I let my inner french blogger loose haha. As soon as I started this segment I went out to the craft store for props to pose with including lots of flowers! Admittedly though I'm a regular at the craft store regardless of this, it's to the point where some of the sales clerks know me by name. I blame the planner life and if you don't know what that means I have a hashtag for you... #planneraddict. Haha. The nail jewel from James Allen adds the perfect touch to a simple french on the accent nail. There's really not a lot to this mani, but the end result can be really pretty. Especially if you decide to go with multi colors instead of just white. 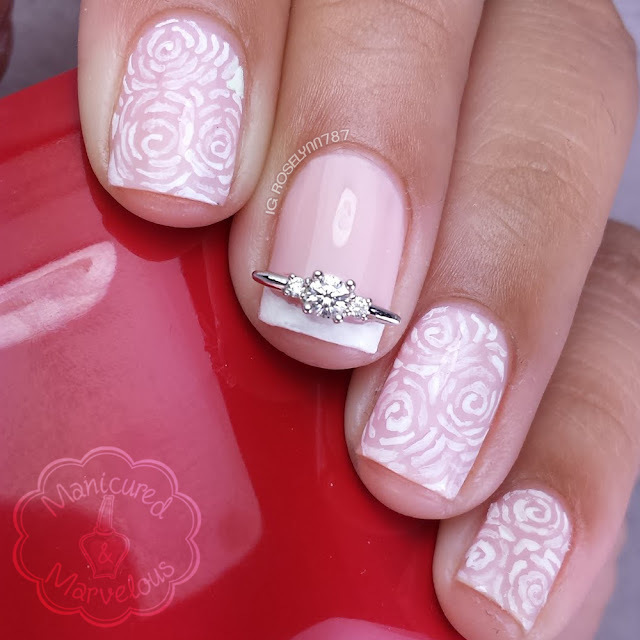 What do you guys think about this mani? Too simple or could you see yourself rocking it for the big day? Hi! My daughter is getting married in September. I've been making her crazy with all the designs I send her. She wants something simple. I want to Bling it up. But. ..it is her day. I showed her something like this and she said it looks pretty but like the charm will catch on everything. When is your wedding? Yes. I shared your design with her. Hopefully she will let me do them for her! Congrats on your wedding. Thank you! I live for floral designs, always a favorite of mine. 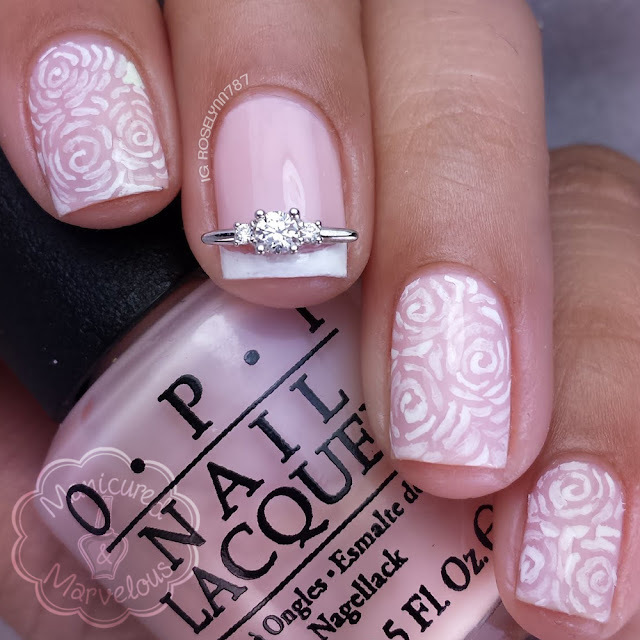 I love the freehand flowers - such a simple and pretty design! Boo to a flooded basement but you'd never know from how glam your nails are! Haha. It was definitely a nightmare to deal with at 7am, but there is no getting these nails down! I find it extremely pretty! And I hadn't realized the white roses were hand painted just until the end! I really thought it was stamping! You are so good. Hope your basement is dry by now! Thank you so much, that's quite the compliment! Basement thankfully is all good now, knock on wood for me lol. This is gorgeous and I love that charm! Love the placement of the charm, and the colors are so soft and pretty. Omgsh this is sooo pretty! Very pretty and definitely could be worn on the big day. This look is dainty perfection!! !